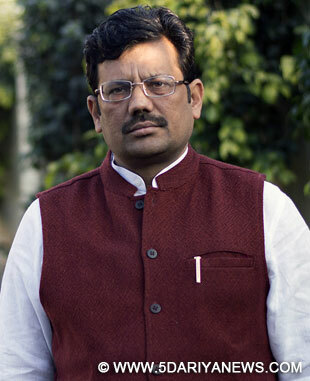 In a significant development, the Punjab BJP president Shri Kamal Sharma has managed a consensus between Punjab and Haryana over the issue of naming of the International Airport at Mohali. According to the information given by the Punjab BJP, following the persistent efforts by Shri Sharma, the Haryana Chief Minister Shri Manohar Lal Khattar, has agreed on naming the Airport after the name of the Shaheed Bhagat Singh. Now, in a letter written to the Union Minister of State for Civil Aviation Dr. Mahesh Sharma, the state BJP president has requested that the Airport be named after Shaheed Bhagat Singh before coming March 23 - the martyrdom day legendry freedom fighter, whose valour and bravery, are epitome for the youth of this country.Releasing a copy of the letter sent to Dr. Sharma to the media, Shri Sharma said that the airport was inaugurated by the Hon'ble Prime Minister Shri Narendra Modi on September 13 last year but name was not announced. "Since we are of the opinion that the Airport be named after Shaheed-E-Azam Bhagat Singh - who is a symbol of the heroism of the youth of India, I met the Haryana Chief Minister Shri Manohar Lal Khattar. After explaining him that the general sentiment is that the Airport be named after Shaheed Bhagat Singh, Khattar has also given his nod for the same", disclosed Shri Sharma.Shri Sharma also informed that apart from this issue, he has also urged Dr. Sharma that announcement for starting the Light and Sound Show at Hussainiwala border in Ferozepur be made before March 23, the martyrdom day of Shaheed Bhagat Singh, Rajguru and Sukhdev. He stated that last year on March 23, Hon'ble PM Shri Narendra Modi himself went to Hussainiwala border in Ferozepur to attend the commemoration programme organised to mark the martyrdom day of the three freedom fighters. Shri Sharma has conveyed Dr. Sharma that during Shri Modi visit, they had requested PM that a light and sound show should be started at the Hussainiwala border. "Being a historical place of great prominence, the light and sound show would not only showcase our rich legacy and heritage but would also encourage the youth to follow the footsteps of the martyrs. At the same time, it would also help Hussainiwala border becoming a tourist hub. The formal proposal in this regard has already been sent to the centre by the Punjab Government", reads the letter. Shri Sharma has requested Dr. Sharma that a formal announcement both - the naming of the Airport, as well as, the approval for the Light & Sound Show should be made beforeMarch 23.